NETWORK FINALS: THE X-FILES dropped 0.1 in final numbers. CABLE HIGHLIGHTS: Basketball was at the top of Wednesday cable. Tru’s continuing coverage of the NCAA TOURNAMENT play-in games was at 0.74/0.45. ESPN’s NBA doubleheader was at 0.71/0.62. VH1’s BLACK INK CREW lost 0.06 to 0.57, and BEAUTY BAR ticked down to 0.27. 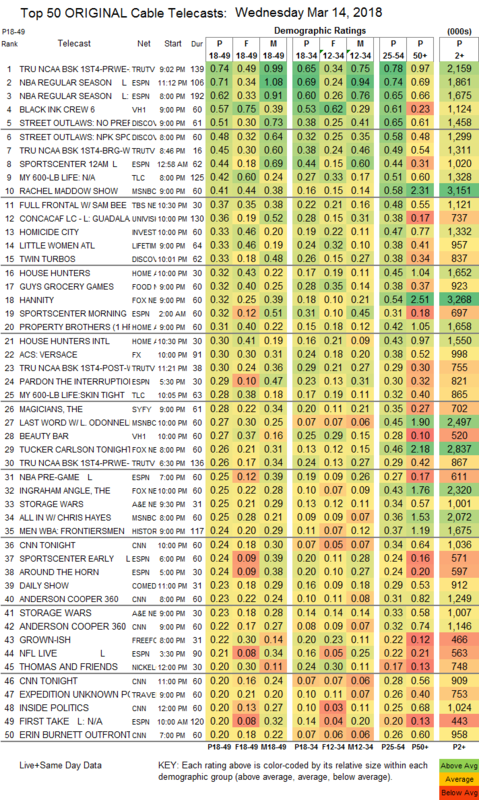 Discovery aired 2 hours of STREET OUTLAWS at 0.51/0.48, compared to last week’s 0.56 hour, then TWIN TURBOS was up 0.04 to 0.33. On TLC, MY 600-LB LIFE dipped 0.03 to 0.42, and SKIN TIGHT was down 0.04 to 0.28. MSNBC’s RACHEL MADDOW SHOW again won cable news in the demo at 0.41/0.58/3.2M, over Fox News’s HANNITY at 0.32/0.54/3.3M, and CNN’s CNN TONIGHT at 0.24/0.34/1M. TBS’s FULL FRONTAL rose 0.05 to 0.37. Univision’s CONCACAF soccer match was at 0.36. On ID, HOMICIDE CITY gained 0.06 to 0.33. Lifetime’s LITTLE WOMEN: ATLANTA climbed 0.07 to 0.33, and GLAM MASTERS ticked up to 0.15. On HGTV, HOUSE HUNTERS grew by 0.04 to 0.32, PROPERTY BROTHERS dropped 0.06 to 0.31, and HOUSE HUNTERS INTL was up 0.05 to 0.30. Food Network’s GUY’S GROCERY GAMES ticked down to 0.32. FX’s AMERICAN CRIME STORY: THE ASSASSINATION OF GIANNI VERSACE edged up 0.02 to 0.30. On Syfy, THE MAGICIANS ticked up to 0.28, and CHANNEL ZERO was up 0.02 to 0.09. On A&E, STORAGE WARS was at 0.25/0.23 compared to last week’s 0.20, and the season finale of ROOSTER & BUTCH was down 0.02 to 0.10. On Freeform, GROWN-ISH ticked up to 0.22, and ALONE TOGETHER ticked up to 0.08. 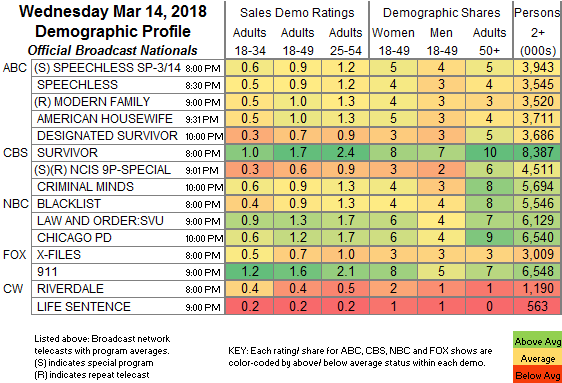 E!’s HOLLYWOOD MEDIUM fell 0.06 to 0.19. MTV’s CATFISH special was at 0.17, followed by 2 hours of FEAR FACTOR at 0.17/0.15. Comedy Central’s CORPORATE dropped 0.04 to 0.13. On POP, SCHITT’S CREEK ticked down to 0.10, and the season finale of LET’S GET PHYSICAL ticked down to 0.01/55K.